If one of your baths is a source of stress, it may be time for bathroom remodeling. With expertise in home remodeling and new construction, we can transform an outdated bathroom to a more efficient and beautiful space. We can even give you a home spa that belongs in a magazine. Call us now for a free estimate. When we begin a bathroom remodeling project, we consider the room a blank slate. We can tear out as much of the existing fixtures as needed to add space and reimagine the layout. Because we’re equipped to handle plumbing and electrical work, we can rearrange your toilet, shower or tub and vanity areas to get the best layout without bringing in a subcontractor. A creative layout is the key component to a highly functional bathroom. Many times, the square footage of a room will be great, but the layout is poor and doesn’t allow the homeowner to transition smoothly from one part of their routine to the next. We will listen to how your family uses the space daily and make suggestions about how your bathroom can be better. If you live in a home with a shared bathroom, you may find that two people tackling their morning routines at once can be more than one household can take. By creating a private area for the toilet and shower areas and including dual vanities, multiple people can use the bathroom at once discreetly. Small children typically require a bathtub. And while the splashing is fun, the cleanup is not. A popular new idea in bathroom remodeling is creating an entire bathing area by placing a bathtub within the shower enclosure. The space is large enough to accommodate the tub, a seating area for drying off and the shower. And the best part is that the kids can go crazy with splashing because you don’t have to dry the floor of the shower. Whatever struggles your family is having with the existing space, we can help find a way to make a new bathroom work for you. We have an A+ rating with the Better Business Bureau because we work hard to make each home remodeling experience pleasant and rewarding. When your bathroom is also used by guests, you need a bountiful amount of storage to keep personal items and clutter concealed. Custom cabinetry can use every bit of space you have to accommodate all of your personal possessions. If space is an issue, there are plenty of recessed cabinetry options that can allow for the same amount of storage without intruding upon the floor space. We commonly use recessed medicine cabinets and laundry hampers. Bathroom remodeling often comes to mind when homeowners grow tired of their outdated shower-tub combo. If you have the space in your bathroom, you can still have both a shower and a tub without them being one in the same. If you’re lacking space, we can help you choose one or the other and give you the best quality bathing experience you could ask for. Many people, especially the elderly and disabled, can no longer use a tub. So eliminating the tub and replacing it with a shower that could easily fit two people or be wheelchair accessible is a wise choice. Other people already have a shower in one bathroom and want a big tub to relax in after a long day. There are a large variety of tubs to choose from, including soaking tubs, corner tubs, spa tubs, stand-alone tubs and more. We can find the perfect fit for your taste, space and budget. Once the major choices are made, we will move on to the details that will complete your bathroom remodeling look. Countertops and flooring have long been dominated by tile. But there are a variety of stylish choices that can create an environment that’s right for your home. We can show you the different varieties of marble, granite, linoleum and even polished concrete. There is a world of choices out there, and we will guide you through it. We provide free estimates on all of our bathroom remodeling projects, as well as any other home or kitchen remodeling projects. We are locally-owned and operated and can handle your job from start to finish. Call us now to get started. 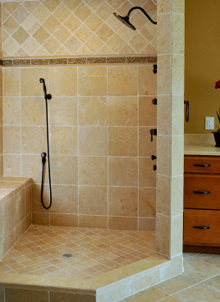 We perform bathroom remodeling in Round Rock, Pflugerville, Georgetown and the surrounding areas.